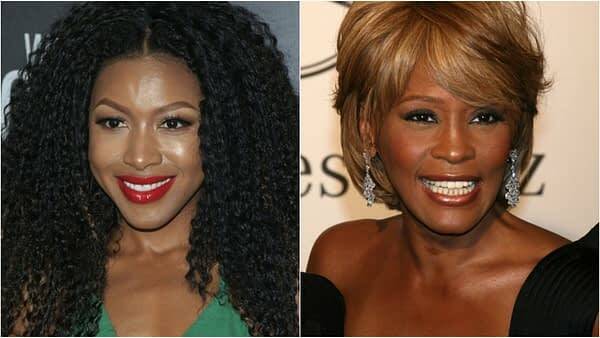 As the network examines the life of veteran R&B/pop singer Bobby Brown post-New Edition, BET has announced that Rosewood‘s Gabrielle Dennis (Girls Trip) will portray iconic singer Whitney Houston in the two-part miniseries The Bobby Brown Story. Set to premiere in September 2018, the project began production this week in Atlanta; written by Abdul Williams (Lottery Ticket, The New Edition Story) and directed by Kiel Adrian Scott (Samaria, Darkly). Joining Dennis and McClain for The Bobby Brown Story are: Mekhi Phifer (Frequency) as Tommy Brown, Bobby’s brother; Lil Rel Howery (The Carmichael Show) as Brian Irvine, Bobby’s business manager; T. K. Carter (The Corner) as Herbert “Pops” Brown, Bobby’s father; Laz Alonso (The Mysteries of Laura) as Louil Silas Jr, an MCA producer-executive who helps make Bobby a solo star; Lance Gross (Star) as Steven Sealy, a childhood friend of Bobby’s who is killed in a gunfight after hanging with him at a hometown bar; Alyssa Goss (B.G.) as Bobby’s current wife, Alicia Etheridge; and Sandi McCree (The Wire), who reprises her The New Edition Story role as Bobby’s mother Carole Brown. The Bobby Brown Story is executive produced by Jesse Collins (The New Edition Story) for JCE Films, a film division of Jesse Collins Entertainment.